Aeroponics is basically hydroponics, but with a twist. Instead of using a growing medium to anchor roots and to run a solution through, the roots are suspended in air and are fed with periodic mistings (set on a timer). A simple aeroponic system can be built by placing 2-inch styrofoam on top of a solid, leak-free table. It is best to have the root environment well draining so that roots don’t sit in a few inches of slow-moving water. One more method is to use a small mesh pot inserted into a larger pail (i.e. 5 to 7 gallons). Aeroponics can also be of assistance to novice growers for the fact that there is less medium (e.g. clay) to hold salts that hinder growth. However there are hydroponic methods that use mediums that do not absorb many salts (e.g. perlite). A disadvantage of an aeroponic system is the higher cost of a high-powered pump that is necessary to create a highly aerated mist. Another disadvantage is when large gardens have clogged misters from specialty plant foods, such as humic acid. When misters get clogged during hot hours, there is only so much time to fix the problem before the wilting damage is irreparable. 1. Drill and 11/2 to 2-inch hole saw. 4. Handsaw or skill saw. 1. One small mesh pot per plant (i.e. 2 inches). 2.Two sawhorses to support the 8 to 12 lengths of pipe. 3. One mister per plant. 4. One 1/8 to 1/4-inch fitting per plant. 5.One piece of 1/8 to 1/4-inch tubing connected from header line to mister per plant. 7. Two 6-inch elbow fittings. 8. 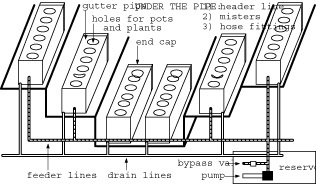 Six-inch pipe cut to equal lengths that are used to hold the plants. 9. Six-inch T-fittings for each length of 6-inch pipe, less the last pipe. 12. 1/2-inch black poly tubing for header lines. 14. 1/2-inch black poly Ts for each pipe, less the last pipe. 15. 1/2-inch black poly end cap for each that runs inside of the 6-inch pipe. 16. One 6 to 10-inch length of 6-inch pipe to connect the drain lines. A. The 4 to 6-inch pipe will be placed on something that supports it. A quick sawhorse can be made with cheap 2×4-inch wood (i.e. 2 to 3-foot lengths) with hinges that the 2×4-inch wood slides into. Another 2×4 (i.e. an 8-foot length) is placed between the hinges to complete an instant sawhorse. B. Two (or more) sawhorses can be used to support the connected pipes. Two sawhorses support an 8 to 12 length of 2×4-inch wood. When the sawhorses are made, the side furthest from the reservoir should be the highest and at equal height. The side nearest the reservoir should be an inch or so lower for every 8-foot length so that the solution drains back into the reservoir. C. All piping (i.e. 6-inch PVC) should be cut to the desired length. D. Holes (i.e. 11/2-inch) should be cut in the pipe at the desired spacing (i.e. 8 to 12-inch centers). The hole sizes must match the pot sizes in order to make a custom fit. E. All lengths of large pipe must have end caps attached to the higher ends that are located at the far end away from the reservoir. F. 1/2-inch poly tubing should be run along the inside of the pipes until it reaches the end. It should be cut to a length that reaches the middle of the T-fittings and elbow fittings that will be connected to the larger pipe at the shorter end. The 1/2-inch poly tubing must have a 1/2-inch end cap at the end. The 1/2-inch poly tubing should have small holes punched into the tubing at the desired spacing (i.e. 10-inch centers), it should have fittings (i.e. 1/8, 3/16, 1/4-inch) inserted into each of the holes, and it should have a line (approximately 1-inch) inserted into the fitting before it is strung through the 6-inch pipe. The appropriate sized tubing should be connected to the fittings in the header line. For example, 3/16-inch tubing should be connected to a 3/16-inch fitting. The tubing should be cut to a length that will reach in between the larger holes (for the pots) with a little slack. G. Small holes should be drilled into the pipe for the feeder tubing (i.e. 1/8, 3/16, 1/4-inch tubing) to be fed through. The hole should be a tight fit. H. A mister should be inserted into the end of the feeder line. Another small hole should be drilled for the mister to fit into. The holes in the pipe should be made in between the pots. The fit with the mister must be snug and secure. I. 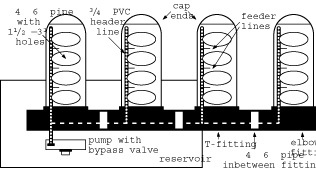 All large pipes (except the last pipe) are connected to their neighboring pipe with T-fittings. For example, 6-inch pipe will use 6-inch T-fittings. Small pieces of pipe are placed between the T-fittings in order to connect the T-fittings and give the desired spacing (i.e. 10-inch centers). J. The last 6-inch pipe will have an elbow fitting that connects to the T-fitting of the second-to-last pipe. K. The first 6-inch T-fitting can be connected to an elbow, then connected to larger pipe in order to send the solution downward into the reservoir without making a mess. A small piece of pipe is placed between the T-itting and elbow fitting to secure the connection. L. Another 1/2-inch poly line will run down through the 6-inch T-fittings and into the last 6-inch elbow fitting of the large pipe above the reservoir. This tubing will be connected to the other 1/2-inch poly tubing that runs through the lengths of 6-inch pipe. All 1/2-inch tubing should have a 1/2-inch T-fitting inserted at the desired spacing (i.e. 10-inch centers), except for the very end. The very end wilbe attached to a 1/2-inch elbow. All of the fittings should be inserted before 1/2-inch tubing is run along the insides of the larger T-fittings and elbow. M. The 1/2-inch poly line with the 1/2-inch T-fittings and elbow fitting should be run along the inside of the larger T-fittings and elbow fitting. N. The large elbow fitting at the end (away from the reservoir) should be removed. The 1/2-inch elbow should be connected to the 1/2-inch line that runs through the inside of the large pipe. Then the large 6-inch elbow and 6-inch T-fitting is reconnected. Piping and fittings can be glued with PVC cement (for PVC) pipe, but, the connections will be permanent. The system will not leak without glue; a little bit of duct tape can be used for securing connections so that disassembling is easy. O. Each 6-inch T-fitting (starting from back to front) should be removed one at a time. When the 6-inch T-fitting is removed, the 1/2-inch poly lines should be connected together at the 1/2-inch T. Then the larger pipe fittings are immediately connected back together after the smaller 1/2-inch tubing is connected to the inside of the larger 6-inch T-fittings. Piping and fittings can be glued with PVC cement (for PVC) pipe, but, the connections will be permanent. The system will not leak without glue; a little bit of duct tape can be used for securing connections so that disassembling is easy. P. At the first 6-inch pipe (above the reservoir), there will be an open end of a 1/2-inch poly T. This loose end should be attached to a small piece (say, 3 inches) of 1/2-inch poly tubing. This tubing is connected to a 1/2-inch poly elbow. A proper length piece of 1/2-inch poly tubing is connected to the 1/2-inch elbow and connected to the pump. A 1/2-inch female fitting may need to be attached to the pump in order to connect the 1/2-inch tubing. This 1/2-inch tubing runs in the inside of the larger piping. Q. Recommended Option: A 1/2-inch poly T should be inserted a few inches above the pump that sits at the bottom of the reservoir. 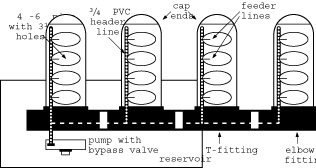 A small piece (say, 3 inches) of 1/2-inch poly tubing is connected to the 1/2-inch T. A bypass valve should be connected to the small piece of 1/2-inch tubing in order to control the flow rate. R. The high-pressure pump should be the size required for the garden dimensions. 2. Misters / feeder lines to mist the roots. In the top-feeding section, there are examples of systems that can easily be converted to aeroponic systems. It is easiest to feed the plants with the pump timer running full-time, only during the light hours. But plants can be fed continuously (all day and all night). Also, plants can be fed intermittently (i.e. every 20 minutes for 2 minutes) during the light hours, and once in the night.